"A gorgeous, restrained meeting of the minds, this recording emboides fine, subtle improvisations from three of today's most iconic players." Despite his deep harmonic language and highly evolved personal sound, enigmatic guitarist Bill Frisell has often been criticized for musical choices that appear to ignore his jazz roots. But he treats jazz simply as one part of a larger musical continuum where Thelonious Monk and Hank Williams can harmoniously coexist. Bill Frisell, Ron Carter, Paul Motian presents him at his jazziest, yet it’s still unequivocally a Bill Frisell record, with the broad scope and quirky mannerisms that have defined his career from the very beginning. Compare Ron Carter and Miles Davis’ ‘Eighty-One’ from E.S.P. (Legacy Recordings, 1965) with the version that opens this record. With one guitar, Frisell distills the essential harmonies of a quintet and delivers them without the feeling that anything has been lost. His mastery of elongated notes and seemingly infinite decays creates a rich sound that’s appealing, ethereal and often ambiguous. It’s a shame that Carter isn’t the first-call bassist he used to be, because here he demonstrates an unassailable groove, muscular sound and big ears on Frisell’s ‘Monroe,’ first heard on Good Dog, Happy Man (Nonesuch, 1999). But instead of Jim Keltner’s firm backbeat, Motian and Carter give it a gently lilting swing. Frisell’s innate sense of humour has always made him an astute interpreter of Monk. Here two blues pieces—the lesser-known ‘Raise Four’ and classic ‘Misterioso’ are given definitive contemporary treatments. In both cases swing is the thing, but Motian—as off-kilter a drummer as Frisell is a guitarist—creates the subtlest unsettled feeling, despite Carter’s firm anchor. Regardless of where he finds his music, Frisell can always be counted on for an odd-angled approach that keeps his musical partners and listeners on their toes. 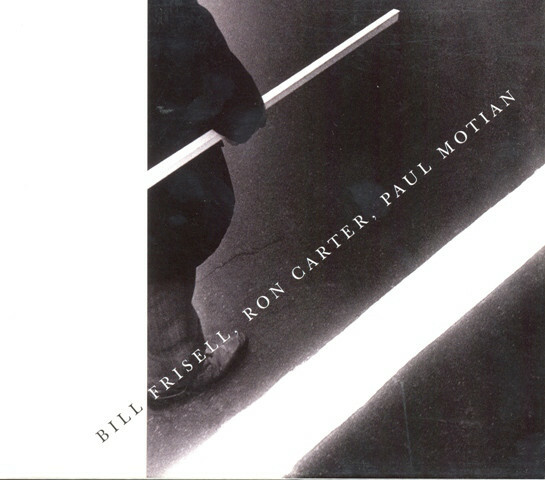 Half the fun is not knowing what’s coming next, and Bill Frisell, Ron Carter, Paul Motian may well be the most unpredictable mainstream record you’ll ever hear. Instead of sporting a catchy album title, this creatively collaborative CD has simply been christened with the names of its three co-creators. With its stress on the musicians' names, the unconventional title is especially significant because the album is all about how these three independent spirits are united here into three voices in one and one voice in three. Obviously, Bill Frisell's guitar is richly expressive throughout a varied repertoire that hops from Thelonious Monk's mystical "Misterioso" to Hank Williams' teary country classic, "I'm So Lonesome, I Could Cry." Yet the CD's often serene, sometimes edgy selections succeed primarily as a splendid collective effort rather than as a string of savory guitar solos. You've got to pay as much attention to Ron Carter's grace on bass and Paul Motian's perpetual motion rhythms on drums as you do to Frisell's flights of imagination. Naturally, you can enjoy listening to each player separately. But the real payoff here is to simultaneously absorb all three voices interweaving together as these empathetic musicians connect on a deep intuitive level. "Eighty-One" ambles amiably in a hip cowboy groove - a bluesy view of riders of the purple sage. "You Are My Sunshine" is warm and luminous. Monk's saucy "Raise Four" is seasoned with brilliant capers.